11/27/2013 - Today's card is a mana ritual that only accelerates you ahead one mana, but can be reused, which falls somewhere between red's one-time acceleration and green's permanent acceleration, hence the hybrid cost. 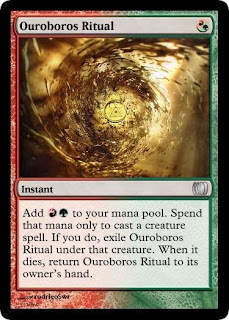 I wonder if the second half of Ouroboros Ritual have potential for a cycle. Cycle? Certainly. A slight tweak might even be mechanic material! The trick is to make the spells impactful enough that it matters when you get them back, but not so impactful that your opponent refuses to kill your creatures. 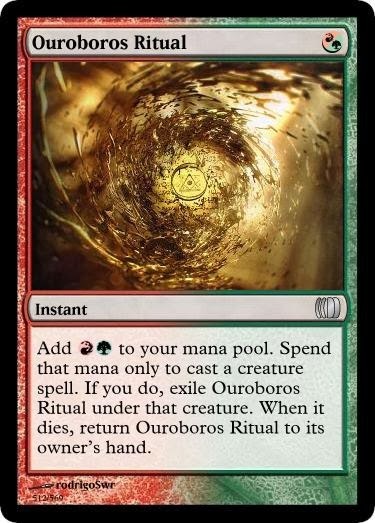 Unrelatedly, why is Ouroboros Ritual an instant? Just for flash creatures? Was thinking the same, but I'm glad for the confirmation. Hmm, should they auto-cast themselves or go to hand? Went with instant purely for flash creatures. Now that I write that out, sorcery seems like the obvious call. My friend Mike points out this probably need to cost 2 and make 3, and I expect he's right. It feels weird that this hangs out in the graveyard before exiling itself under the creature that's cast later. Does that work within the rules? What happens if you only use one of the mana to cast a creature? Good point. Maybe: "Cast a creature spell for up to RG less. Exile ~ under it" or something. 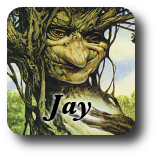 If this card existed I would be all over janky first-turn Burning-Tree-Emissary decks.